THE SHADE OF THE TREES by Brown, JaCK: Todd & Honeywell, Great Neck, New York, U.S.A. 9780899626659 Hardcover, Signed by Author(s) - Vagabond Books, A.B.A.A. 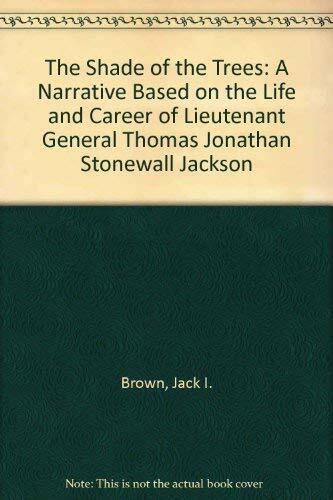 Publisher: Todd & Honeywell, Great Neck, New York, U.S.A.
Book by Brown, Jack I.
Masquerading as a novel, this hero-worshipping tract on the life of Civil War hero Thomas &quot;Stonewall&quot; Jackson traces the Confederate general's career from his impoverished origins in Clarksburg, Va., to his adventures in our war with Mexico and in the war between the states, and finally to his death at the hands of his own men at Chancellorsville. Although ostensibly told by a fictional aide of Jackson, Caleb Joshua Sparks, the narrative is written mainly in the third person; Sparks's participation in the events he is supposed to have witnessed doesn't show itself for chapters at a time. In a prefatory note, Brown confesses that he invented Sparks to deflect critics who might quarrel with his use of facts. With this artless abdication of responsibility, the writer declares his intention to commit a fiction, yet the narrative does not have the integrity of a novel. With its gee-whiz diction, non sequiturs, narrative gaps and, in places, outright illiteracy, this work falls well below normal American book publishing standards. <br />Copyright 1988 Reed Business Information, Inc.